Mount Defiance and its lower neighbor, Putrid Pete’s Peak, recline westward from Bandera Mountain‘s flower-clad flanks. Ira Spring Trail, July 09, 2014. In a quiet glade just beyond the popular Mason Lake, the trail to Mount Defiance parts from the Ira Spring Trail and begins its steady climb up the mountain’s heavily forested spine, only relenting in its ascent to cross a high alpine meadow before redoubling its upward thrust in its final approach to the summit. Few others venture this far or this high. From the mountain’s stone pinnacle, views take flight in every direction, encompassing jewel-like lakes nestling about its feet, the South Fork Snoqualmie River Valley riven along its southern flank, and snow-tipped Cascade peaks stretching northward, eastward, and southward as far as the eye can see. Like Bandera Mountain, its neighbor to the east, Mount Defiance hosts a brief, early summer spectacle of wildflowers in a steeply pitched meadow across its upper swath. The trail commences at the Ira Spring trailhead, which also provides access to Bandera Mountain, Mason Lakes, Rainbow Lake, Island Lake, and other destinations by connecting trails. This profile begins approximately a quarter mile/0.40 km beyond Mason Lake, where the trail branches southwest from the Ira Spring Trail. The trail’s round-trip distance to and from the Ira Spring trailhead is approximately 11.00 miles/17.70 km. Along much of the trail, Mount Defiance is clad in a dense wood of mountain hemlock (Tsuga mertensiana). Mount Defiance Trail, July 09, 2016. From carpet to canopy, the lush woodland supports layers of life and even the forest columns are clothed in shaggy wisps of witch’s hair (Alectoria sarmentosa), a moss-like lichen. Mount Defiance Trail, July 09, 2016. In comparison to the riotous floral display at the mountain’s alpine heights, few flowers grace the dense woodland that cloaks the mountain’s lower altitudes. Look for fungi amongst the abundant forest litter and the scarce, usually pallid blooms that thrive amid the sylvan shadows. Wood conks, likely artist’s conks (Ganoderma applanatum), spiral around a trailside snag. Mount Defiance Trail, September 10, 2012. Possessing no leaves or chlorophyll, western coralroot orchids (Corallorhiza mertensiana) need no light and thrive in deep forest shade by deriving sustenance from fungi in the soil. Mount Defiance Trail, July 09, 2016. White marsh marigolds (Caltha leptosepala) (left) brighten the occasional damp spot on the forest floor. Here and there, fancifully formed stalks of beargrass (Xerophyllum tenax) (right) accent the shadowy woodland understory. Mount Defiance Trail, July 02, 2016. Occasional windows in the heavy forest afford glimpses of the vistas to come. Here, Kaleetan and Chair peaks top the northeastern horizon. Mount Defiance Trail, July 02, 2016. Midway up the trail, Lake Kulla Kulla’s sheen appears just beyond the forest fringe. In preparation for the views to come, take note of how near it seems now. Mount Defiance Trail, July 09, 2016. Nearing the summit, the trail departs the relentlessly steep eastern ridge and traverses the massive meadow on the mountain’s southern flank, providing welcome relief before it resumes its ascent up the western spine. Mount Defiance Trail, July 02, 2016. Mt. Rainier rides the southern horizon beyond the meadow’s floral fringe. Mount Defiance Trail, July 02 2016. Elsewhere, daisies (likely wandering daisies, or, subalpine fleabane, Erigeron glacialis), fence the sweeping southeast view beyond the trail. Mount Defiance Trail, July 02, 2016. The mountainside meadow hosts a variety of early summer blooms, including, clockwise from top left, Columbia lilies Lilium columbianum), subalpine spirea (Spiraea splendens), heart-leaf arnica (Arnica cordifolia), scarlet paintbrushes (Castilleja miniata), and Sitka valerian (Valeriana sitchensis). Mount Defiance Trail, July 02, 2016. Appearing similar at first glance, blue and purple spires among the meadow blooms are those of two distinct species: lupine (Lupinus sp.) (left), with bonnet-like blossoms typical of the legume family, and littleflower, or, pincushion penstemon (Penstemon procerus) (right), which sports fuzzy throats that earn the penstemons their other common name, “beardtongues.” Mount Defiance Trail, July 02, 2016. At the far end of the meadow, watch for an easily missed fork in the trail and be sure to take the rightward path, sometimes marked by a small cairn, that leads backward and up a short but steep incline of boulders and loose gravel to the summit of Mount Defiance. Continuing straight, the left fork leads approximately four miles/6.40 km to Thompson Lake. Mount Defiance Trail, July 02, 2016. From the cloud-rooved summit, the altitude achieved is proven by the view back down upon the thumbprints of the now faraway lakes passed along the way: Lake Kulla Kulla, Little Mason Lake, and Mason Lake. Mount Defiance Trail, July 02, 2016. Rank upon rank of mountain ridges reach south to Mt. Rainier and, barely visible above the horizon, Mt. Adams. Mount Defiance Trail, October 05, 2013. Snowy peaks crowd the view northward from Mount Defiance. Mount Defiance Trail, October 05, 2013. 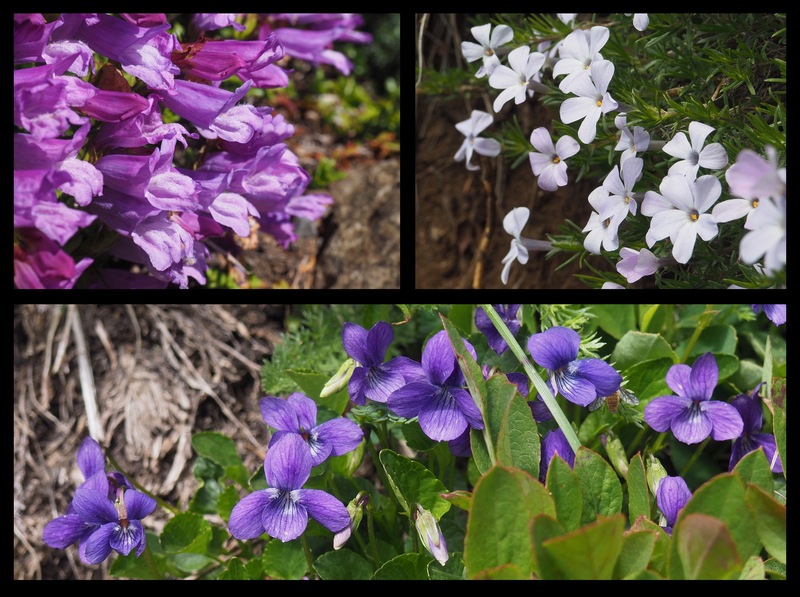 Groundcover blooms soften the mountaintop stone, including Davidson’s beardtongues (Penstemon davidsonii) (top left), spreading phlox (Phlox diffusa) (top right), and hookedspur violets (Viola adunca) (bottom). Mount Defiance Trail, July 02, 2016. A sunburst spotlights the South Fork Snoqualmie River Valley below the lower western ridge of Mount Defiance. The prominent point at the far end of the ridge that slopes west of Mount Defiance is Putrid Pete’s Peak, reportedly named in honor of Pete Schoening, a local mountaineer famous for quick action that saved five fellow climbers from certain death on K2 in 1953. Mount Defiance Trail, September 10, 2012.